The URS system was created as a low-cost, quicker alternative to the Uniform Domain Name Dispute Resolution Policy (UDRP). It is designed to address only “clear cases of trademark abuse” in new gTLD extensions (and the country code TLDs that adopt it) … and not intended for proceedings with “open questions of fact.” See URS Procedure Rule 8.5. The URS rules and procedure are available here and here. There are also numerous articles online with general overviews on how the URS complements and differs from the UDRP. This is a good one. the URS tracks the UDRP’s three-prong test for Complainants; however, to establish the first element under the URS a Complainant must own a “word mark” that is registered and in current use (common law rights will not suffice) or “validated” or protected by statute/treaty. Rule 1.2.6.1.
the Complainant must prove all three elements by clear and convincing evidence (a higher burden than the UDRP’s preponderance standard). Rule 8.2.
if a Complainant prevails the domain name is suspended – not transferred – and locked down for the balance of the registration period. Rule 4. … the applicable top-level suffix in a domain name is usually disregarded under this test, except thus far generally in certain cases where the applicable top-level suffix may itself form part of the relevant trademark … given the advent of multiple new gTLD domain names, panels may determine that it is appropriate to include consideration of the top-level suffix of a domain name for the purpose of the assessment of identity or similarity in a given case, and indeed that there is nothing in the wording of the Policy that would preclude such an approach. Canyon Bicycles GmbH v. Domains By Proxy, LLC / Rob van Eck (WIPO Case No. D2014-0206). With many new gTLDs being common English words or abbreviations, pairing a trademark with a new gTLD suffix can have a significant impact on the overall impression created by a domain name. This is especially true of arbitrary trademarks, which — while considered “strong” trademarks — may become generic words when combined with certain new gTLDs. For example, coupling the famous arbitrary trademark APPLE with a .food TLD creates the generic wording <Apple.food>. Typically, a new gTLD is used to describe the core business offered under the mark in the second level domain (e.g. Canyon.bike). In these cases, the new gTLD actually reinforces the trademark and confusing similarity. See Id. Some new gTLDs, however, are less specific and don’t necessarily describe a product or service but instead suggest a particular use — for example: .club, .buzz, .parts, .wtf, .email, .social, etc. The weight given to the words in these new gTLDs, when combined with a third party trademark, will depend on the context of their use. Ultimately, the first prong under the UDRP/URS functions as a standing requirement that is easy for Complainants to satisfy and doesn’t have the same dispositive effect that a finding of confusing similarity would have under trademark law. What really matters from a UDRP/URS perspective is the Respondent’s intent at the time of registration, whether the use is fair and the extent of commercial activities, if any. Legitimate use and bad faith registration of a domain name are assessed under the second and third UDRP/URS elements. The recent URS decision Dr. Ing. h.c. F. Porsche AG v. Interactiv Corporation, FA1407001571774 (NAF August 18, 2014 Determination and September 10, 2014 Appeal) over the <Porsche.social> domain name reveals how URS panels are weighing alleged fair uses of domain names with new gTLD suffixes. Furthermore, the Examiner found the .social TLD suffix to be evidence of intent to make a fair use. Registrant is making a legitimate or fair use of the domain name, without intent for commercial gain to misleadingly divert consumers or to tarnish the trademark or service mark at issue. The domain name is generic or descriptive and the Registrant is making fair use of it. The domain name sites are operated solely in tribute to or in criticism of a person or business that is found by the Examiner to be fair use. Moreover, the U.S. Court of Appeals for the Ninth Circuit has ruled that nominative fair use extends to trademarks incorporated into domain names. See Toyota Motor Sales, U.S.A., Inc. v. Farzad Tabari, et al., 610 F.3d 1171 (9th Cir. 2010) (more on the Tabari decision below). With a higher “clear and convincing” standard and open questions of fact as to whether Respondent engaged in clear cut trademark abuse, the initial Examiner’s decision in Porsche.social perhaps shouldn’t be surprising. 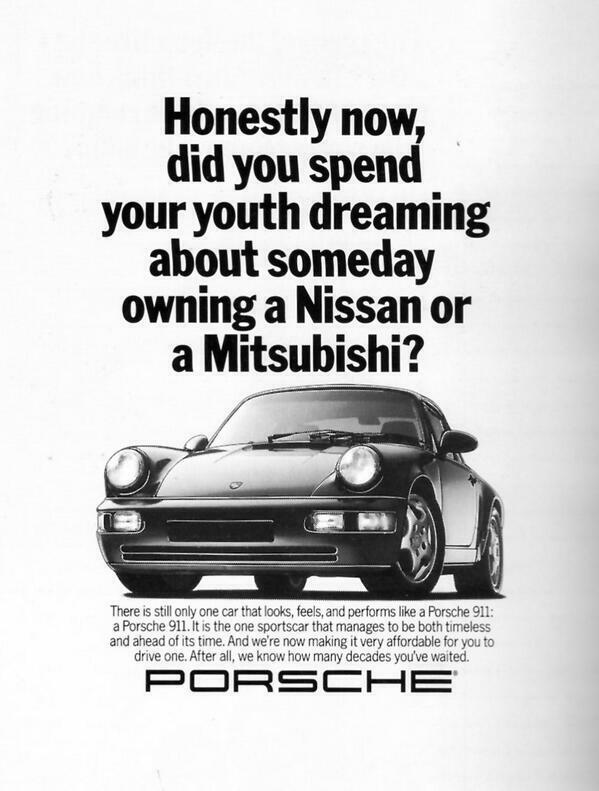 Nor was it surprising that Porsche appealed. 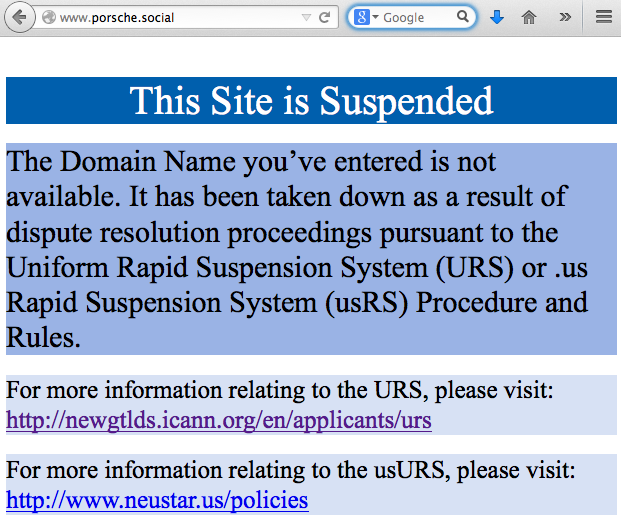 On appeal, a three member panel of Examiners reversed the decision and suspended the Porsche.social domain name. … use of a domain name to post parking and landing pages or PPC links does not of itself confer rights or legitimate interests arising from a “bona fide offering of goods or services” or from “legitimate noncommercial or fair use” of the domain name, especially where resulting in a connection to goods or services competitive with those of the rights holder. By contrast, such use – as in this case – is a clear indication of unfair use resulting in misleading diversion. As a domain holder is always responsible for how the specific domain name is used, the Respondent cannot deny any responsibility of such use of <porsche.social>. The panel concluded by turning Respondent’s intent to use the Porsche.social site as a “free community to Porsche car enthusiasts” into an indicator of bad faith registration. It decided the Complainant had established all three elements by clear and convincing evidence, reversed the final determination, and ordered the domain name be suspended. My Comments: Is this the kind of case the URS was designed to handle? The record shows the site was parked with advertising links but the Respondent denied actively creating the links. Domain name registrars will park inactive websites as a courtesy and often without a registrant’s knowledge. Doesn’t that — in itself — raise an open question of fact, especially where, as here, all indications are the domain name is to be used for a legitimate purpose? Or, do mere pay per click/parked pages alone for planned fan sites create a clear cut case of trademark abuse? The extent to which a domain name registrant for a claimed fan site must limit commercial activities in order to maintain a legitimate fair use is an unsettled area in domain name disputes. Pay-per-click links and automated advertising suggest an intent to profit from a site that is not a legitimate fair use; however, some limited commercial activity is allowed: “panels have recognized that a degree of incidental commercial activity may be permissible in certain circumstances (e.g., where such activity is of an ancillary or limited nature or bears some relationship to the site’s subject).” See WIPO UDRP guidelines. These are case specific determinations. Domain name registrants for fan/tribute/community/criticism sites need to be aware of what’s on the landing page and cautious of any commercial activities. Complainants must question whether the URS, with its higher burden of proof, is the proper action for challenging a purported fan/tribute site (even if the site is parked). The importance ascribed to trademark.com in fact suggests that far less confusion will result when a domain making nominative use of a trademark includes characters in addition to those making up the mark … a number of sites make nominative use of trademarks in their domains but are not sponsored or endorsed by the trademark holder: You can preen about your Mercedes at mercedesforum.com and mercedestalk.net, read the latest about your double-skim-no-whip latte at starbucksgossip.com … Consumers who use the internet for shopping are generally quite sophisticated about such matters and won’t be fooled into thinking that the prestigious German car manufacturer sells boots at mercedesboots.com, or homes at mercedeshomes.com, or that comcastsucks.org is sponsored or endorsed by the TV cable company just because the string of letters making up its trademark appears in the domain. When it comes to fan sites, there is a strong First Amendment interest in play. The URS and trademark fair use doctrine are both designed to prevent trademark abuse … from opposite ends of a spectrum of trademark uses. With new gTLDs there will be more domain names raising questions of legitimate use and where, along the spectrum, they should fall.